It’s Super Shoot time. The “Top Guns” of Point Blank Benchrest are battling for prizes and glory at Kelbly’s Rifle Range in North Lawrence, Ohio. 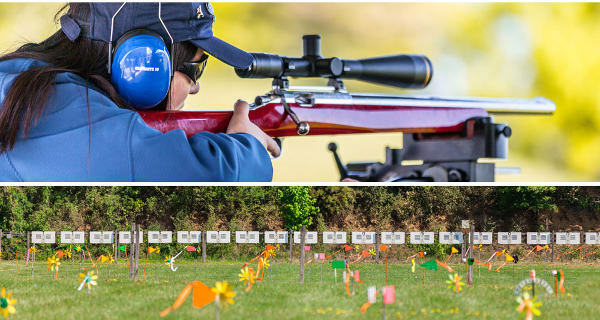 This annual event, held May 25-28 this year, draws some of the best 100-yard and 200-yard benchrest shooters in the world. Recent Super Shoots have drawn 300+ competitors from the USA and more than a dozen other countries (about 15% of the competitors come from overseas). The excitement and anticipation leading up to a Super Shoot can be hard to explain to those who haven’t been to one. Every year, some shooters arrive at the Super Shoot a week early to dial in their rifles, learn wind conditions for the range, and enjoy the camaraderie of their fellow shooters. As the match draws closer, campers and RVs fill the area behind the range, and shooters stake out turf all over the property with their reloading and cleaning equipment setups. 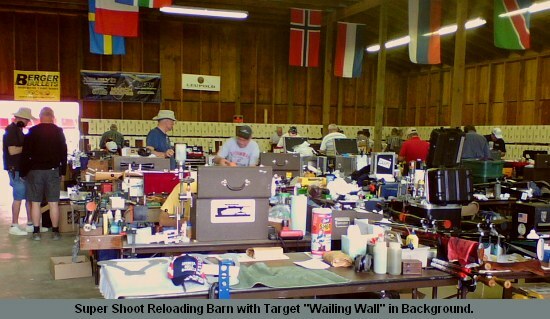 Many shooters choose to load cartridges in the main barn directly behind the 60-bench firing line, while others decide to work in pop-ups, campers and other outbuildings around the facility. Benchrest shooters tend to load in small batches, and some most load cartridges between each match. Many shooters clean their rifles after each match, while others sometimes go two or three matches between cleanings, depending on the number of rounds they fire. Another part of high-level benchrest competition that will amaze first-time attendees is the quality and amount of equipment benchrest shooters use. Just in front of the shooting benches and the targets, range flags of all kinds sprout up, from the typical “daisy wheel” flags to very sophisticated velocity indicators that show varying wind intensity. Shooters adjust their flags to align with the particular target in front of a specific bench, just slightly below the path of the bullet but still partially visible in the high-powered scopes. The rifles represent a variety of actions, usually custom, with heavy benchrest barrels by various barrel makers. The most popular cartridge used is the 6mm PPC, but occasionally you will run into someone using a 6mm BR or a slightly modified 6mm BR, and as well as a few other cartridges. Rifle rests used are typically heavy tripods or plate rests. You see a lot of Sinclair rests, Farley rests, and a variety of others, including a few homemade rests. Bags are typically Edgewood or Protektor. Anyone who attends the Super Shoot will come away with a greater appreciation of precision benchrest shooting. Experienced benchresters already know there will be windy days that drive them crazy, and less experienced shooters can get completely lost when… holding off a shot in the wind. But the reward is worth it. It’s very satisfying to hold off a full inch at 100 yards because the wind changes during your string and drop your fifth shot into a sub 0.100″ group with only seconds remaining on the clock. And that’s what the Super Shoot is all about. 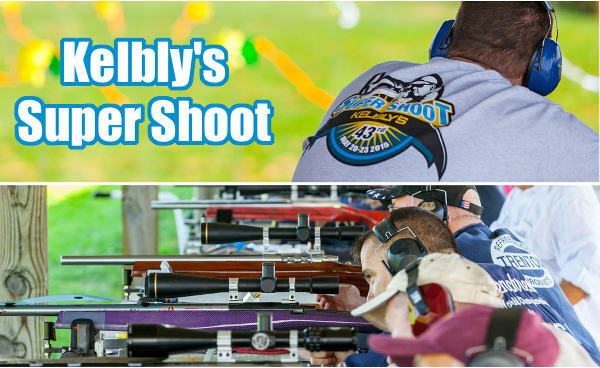 Share the post "Kelbly’s Super Shoot Draws World’s Best Benchrest Shooters"
The A17 is a 17 HMR semi-automatic with delayed-blowback action. Previous semi-auto 17 HMR designs struggled to cope with the extra power of the 17 HMR cartridge compared with a .22 LR. Savage solved that problem using a delayed blowback mechanism with retracting locking lug. You can see how that works in the video below. This Savage-produced video demonstrates how the 17 HMR Savage A17 rifle works. The video includes nicely-done 3D Graphics that illustrate the function of the A17’s delayed-blowback action with “interrupter lug”. Using “X-Ray View” animation, the video shows what happens INSIDE the chamber as rounds are fired. The video also explains how the 17 HMR presents a tougher engineering challenge than the lower-pressure .22 LR cartridge. NOTE: This entire test was performed without cleaning the barrel. 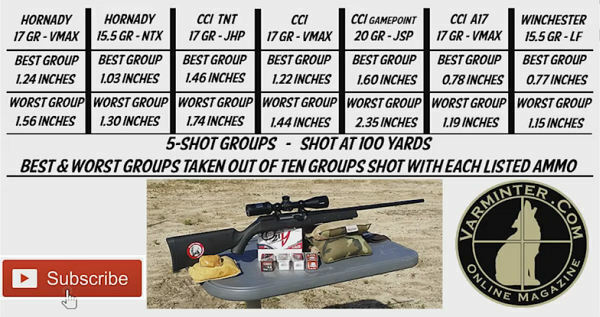 For each ammo type, ten (10) 5-shot groups were done. That’s seven times 50, for a total of 350 rounds. 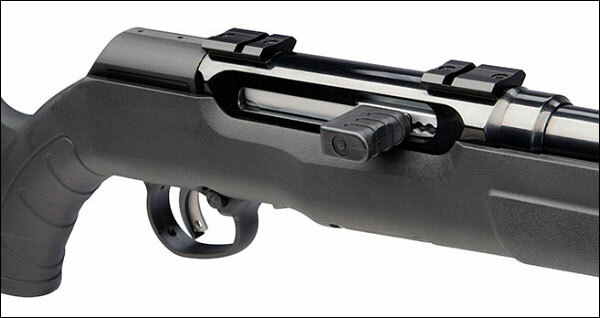 The gun used Savage’s original, first-generation polymer A17 stock. Some folks have reported better accuracy with the late-model A17s in the laminated wood thumbhole stock or the laminated wood Sporter Stock (shown below). Share the post "Savage A17 Wins American Hunter’s Rifle of the Year Award"
When developing loads, it is important to know the true internal capacity of your cases, both fired and “as FL-sized”. In particular, when using the QuickLOAD program, it is vital to determine true case capacity. The default case capacity values listed by QuickLOAD may be off half a grain (or more) because brass from different manufacturers can vary considerably in capacity. Case capacity is a very important variable that will affect the pressure of a load and the velocity of your bullets. To determine the true internal capacity of your cases, first weigh an empty cartridge case, then fill the case with water (all the way to the top of the neck) and weigh the case again. The difference in weight is your H20 capacity in grains. But how do you keep the H20 from flowing out the bottom? When measuring fired, unsized cases, you can simply leave the spent primer in the pocket. However, if you want to measure new brass or “as-FL sized” cases that have been deprimed, you’d have to insert a spent primer to “stem the tide”. 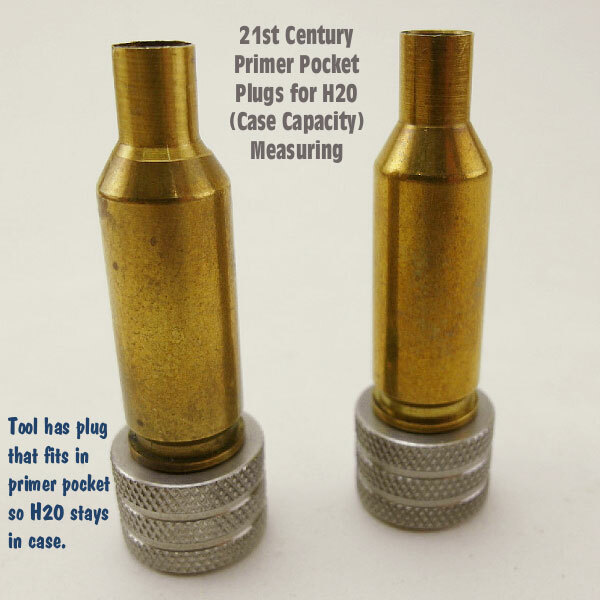 Until now that is… 21st Century Shooting sells a great little $11.99 tool that plugs the bottom of the case so you can measure H20 capacity with ease. When we saw 21st Century’s Primer Pocket Plug we thought “That’s smart — why didn’t someone think about that a long time ago?”. This handy “end-cap” lets you quickly measure multiple new brass cases or deprimed FL-sized cases so you can get an average H20 capacity. The primer pocket plugs are NOT case-specific (they feature an O-ring that fits the pocket). One version will work with all small-primer-pocket cases, while another works with all large-primer-pocket cartridge types. Price is $11.99 for either small-pocket or large-pocket version. NOTE: If you want to measure H20 capacity on fired, sized brass, but don’t want to shell out the money for the tool (or re-insert a spent primer), here’s a simple suggestion. When you size your case, first remove the decapping rod from the die. Then you can FL-size the case without removing the primer. Of course, you will eventually have to knock the primer out, and that requires putting the decapping rod back in the die and running the case through a second time. To avoid that hassle, the Primer Pocket Plug may be worth the twelve bucks over the long haul. Product Find by EdLongrange. We welcome reader submissions. Share the post "Primer Pocket Plugs Help You Measure Case Capacity Accurately"